NEWCASTLE — The mission of the Frances Perkins Center includes the continuation of Perkins’ work for social justice and economy security. 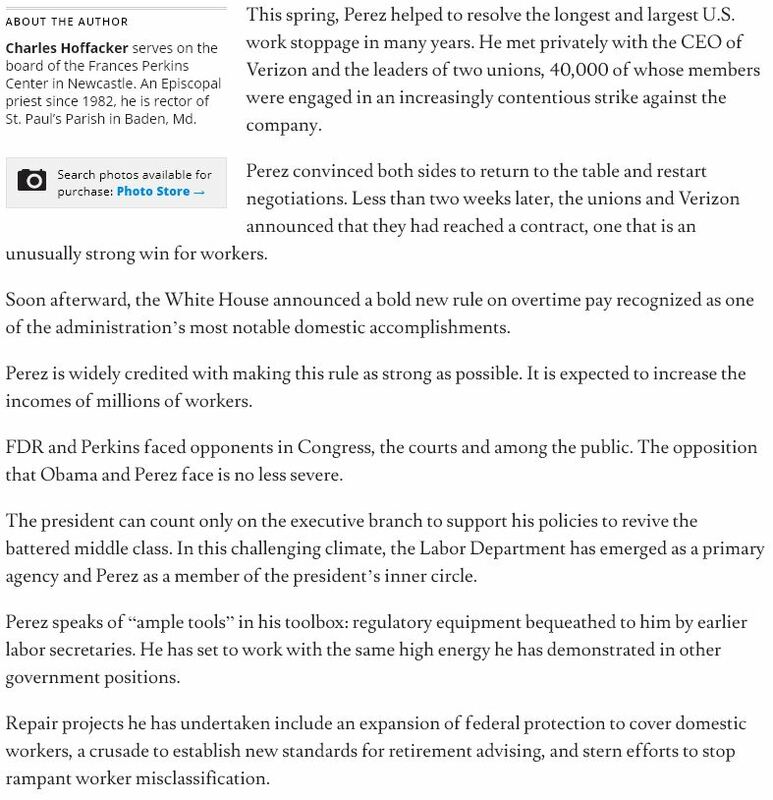 The current labor secretary, Thomas Edward Perez, has shown himself to be a remarkable model in carrying on the Perkins tradition. Appointed by President Obama in 2013, Perez has repeatedly referred to Perkins as his “North Star.” Her portrait appears behind his desk. This spring, Perez helped to resolve the longest and largest U.S. work stoppage in many years. He met privately with the CEO of Verizon and the leaders of two unions, 40,000 of whose members were engaged in an increasingly contentious strike against the company. Perez convinced both sides to return to the table and restart negotiations. Less than two weeks later, the unions and Verizon announced that they had reached a contract, one that is an unusually strong win for workers. Soon afterward, the White House announced a bold new rule on overtime pay recognized as one of the administration’s most notable domestic accomplishments. Perez is widely credited with making this rule as strong as possible. It is expected to increase the incomes of millions of workers. FDR and Perkins faced opponents in Congress, the courts and among the public. The opposition that Obama and Perez face is no less severe. The president can count only on the executive branch to support his policies to revive the battered middle class. In this challenging climate, the Labor Department has emerged as a primary agency and Perez as a member of the president’s inner circle. Perez speaks of “ample tools” in his toolbox: regulatory equipment bequeathed to him by earlier labor secretaries. He has set to work with the same high energy he has demonstrated in other government positions. Repair projects he has undertaken include an expansion of federal protection to cover domestic workers, a crusade to establish new standards for retirement advising, and stern efforts to stop rampant worker misclassification. Perez became more widely known during the period earlier this year when he was a leading contender for the Democratic vice presidential nomination. His background is a compelling narrative. Perez’s parents were political refugees from the Trujillo dictatorship in the Dominican Republic. His maternal grandfather, the Dominican ambassador to the United States, was exiled after speaking out against the dictatorship’s massacre of thousands of Haitians. Perez grew up in Buffalo, New York, where he witnessed firsthand the devastating effects of deindustrialization in the 1960s and 1970s. Admitted to Brown University, he worked in a warehouse, a cafeteria and as a trash collector to help pay his way through. From there he went to law school because he wanted to change the world for the better. Soon after graduation, he took a job in the Civil Rights Division of the Department of Justice, then worked for the Senate Judiciary Committee. When he taught law at the University of Maryland, his students surveyed victims of predatory lending. In Montgomery County, Maryland, he was elected to the County Council and advocated legislation not then in the political mainstream. Three years later, his colleagues chose him as council president. From there he became head of the Maryland Department of Labor. When Barack Obama was elected in 2008, Perez was charged with making the Justice Department’s Civil Rights Division functional again. He turned around morale and enabled the division to regain its effectiveness at legal enforcement. Perez has been described as a trial lawyer at heart. The client he so ably represents is the American principle that opportunities should be available to everyone.